Department of Clinical Nutrition at UQU College of Applied Medical Sciences held a scientific introductory forum of internship at Al-Nour Specialized Hospital in collaboration with the Medical Education Center in the Hospital. The forum aimed at introducing internship year to department female students besides everything related to internship year including; commitments, works, and requirements within the plan of the College Vice Deanship for Hospital Affairs. 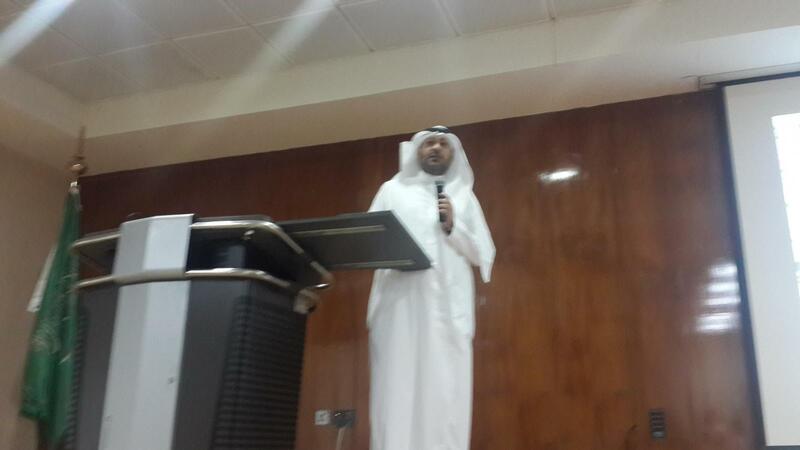 The forum was launched by the Dean of College of Applied Medical Sciences Dr. Ahmed bin Mohamed A'shi who welcomed the audience and praised efforts of the college and department to complete all educational phases for the female students in the department of clinical nutrition including internship year. He also expressed his thanks to the College Vice Dean for Hospitals Affairs Dr. Mahir Al-Andijani, the Head of the Department of Clinical Nutrition Dr. Haifaa Hijazi and members of teaching staff in the internship committee besides the committee of hospitals training in the department. The College Vice Dean for Hospitals Affairs Dr. Mahir Al-Andijani attended the forum and delivered a lecture on the duties and rights of the students during the internship period and distribution of female students in hospitals. He also responded to female students queries. The meeting was attended by the Head of Clinical Nutrition Department Dr. Haifaa Hussein Hijazi and a number of members of the teaching staff including; Dr. Mustafa Asfar, Dr. Firas Al-Izah, Dr. Samaa Al-Soadaa, Dr. Al-Sayed Hamid Bakr, Dr. Siham Al-Sayed Zahran, and Dr. AbdulElah Jazar. The targeted group were the fourth year female students in the department who will start their internship year in Ramadan, Allah willing. At the conclusion of the forum, the Dean of the College and the Head of Clinical Nutrition Department expressed their thanks to the Director of Al-Nour Hospital and the Head of the Nutrition and Special Diets for the warm welcome and gracious hospitality wishing lasting partnership and cooperation between the two sides.